Inhale, Exhale. Know What You’re Breathing! Back in August of 2013 our community lost one of our own due to a simple mistake. Carlos Fonseca took a bottle to Ginnie which was permanently marked for oxygen; he swore it was filled with air. Unfortunately, it was not. A simple error cost him everything, it was a moment I will never forget because it really drove home for me how important this simple procedure is. He was the first diver I had come to know personally in this community who perished doing something I love. It was a lesson I have not forgotten, analyzing a cylinder for gas content and marking it properly saves lives. Sadly, it seems many have not learned from his mistake or have conveniently forgotten. Sadly, I still hear the same trite remark I’ve heard entirely too many times. ‘Oh you guys bank 32% right? Great, I trust you.’ Really?! You trust me? I’m sorry to announce, I’m simply a human, and humans can and do make errors. Even simple errors in diving can cost you everything. Why is a less than one minute process not worth your life? Why are we failing to take the short bit of time to analyze and properly label our gas mixtures? Labels for cylinders exist in many forms, at a minimum, a label with the percentage of oxygen and helium and the MOD should be in a spot on the cylinder clearly visible to all team members. One thing I see often is distraction. When I’m going diving, I take setting my equipment up seriously. I don’t like distractions because distraction leads to something being forgotten or missed. In the past I have let distractions get to me and I have left fins, primary light, and other important pieces of gear at the house or shop forcing me to abort my dive and do the walk of shame back to my pickup. Now I set all of my gear up when I know I won’t be interrupted by something or someone, or at minimum do a second check of my gear to make sure everything is in place before I take it out to the dive site. One busy day at the shop, I had a customer ask me to fill aluminum 40 with 50% oxygen. Using a 40 for 50% is not common in this area, generally we see people filling that sized cylinder with 100% oxygen. While I was filling, the customer ran into a friend in the shop and began chatting. Another customer came in and asked me to fill a very similar aluminum 40 with 100%. I finished the first cylinder and placed it in front of our shop analyzer. I informed the first customer where the tank was and that he was welcome to use the analyzer should he need it. I returned to filling the second cylinder. When I finished I put the cylinder out across from the first, far enough away that it shouldn’t have caused an issue. I had a third customer came in who needed nitrox fills, while I went out to fill the nitrox the first customer grabbed his bottle. At least, he assumed it was his bottle. What he actually grabbed was the very similar aluminum 40 with 100% belonging to customer number two. Had he taken the minute to analyze and properly mark the bottle, this whole thing would have been avoided. Thankfully, we were able to catch him before he made it out to the dive site and he and the second customer left with the correct bottle. This could have caused a real issue for diver number one using the 50%, as 100% oxygen becomes toxic below 20ffw. Another problem I see is failure to properly label bottles. Just because you have personally analyzed your gas and know what’s in your bottle, does not mean you shouldn’t label your cylinders. Failure to mark your bottles can lead to improper gas switches which could be easily caught by you or your team member(s) with appropriate labeling. A simple procedure that takes mere seconds could save you from switching to the wrong gas at the wrong time or sharing the wrong gas with your team member should a need arise. Unfortunately mislabeling of cylinders is not a myth and cost Bobby McGuire his life. While performing a gas switch at 150’ he mistakenly switched to a 50% bottle. His bottles were labeled ‘1’ and ‘2’. Had he labeled these gases with the percentages and correct MOD’s he likely would be alive. (Read more about Bobby McGuire on my friend Ken Sallot’s blog: http://www.divegainesville.org/always-check-your-gas/) Labeling cylinders with numbers, color coding your cylinders or regulators, etc. seem like great ideas, but none of them are 100% effective ways to ensure you are breathing the right gas. The only proven method is analyzing, labeling the tank clearly with percentage, and MOD and having a team member verify that you are in fact switching to the proper gas. Don’t you owe it to yourself, and your friends and family to preform these simple tasks to ensure your own safety? Every cylinder should get a proper marking. Yes that means every sidemount bottle, every backmount set, every stage, every decompression bottle, every time. No excuses! Ensuring you ask the fill station operator to fill the correct gas is imperative especially when your tanks are permanently marked for a gas mixture. We once had a customer near irate at a staff member for asking multiple times if they really wanted oxygen in a permanently marked diluent CCR cylinder. Finally the customer realized the cylinder was marked for diluent and promptly apologized that he had given the wrong instructions. Thankfully our staff knew to ask and fill the correct mix. Every professional dive shop I’ve been to has a nitrox analyzer available for use and every professional shop I’ve been to has a helium analyzer as well if they are supplying trimix. In short, analyzing and properly marking your cylinders takes only moments to do and can save your life. Every professional dive shop I’ve been to has a nitrox analyzer available for use and every professional shop I’ve been to has a helium analyzer as well if they are supplying trimix. We know it can keep you and your team safe, why would you skip a few seconds of proper procedure when the analyzers are readily available at the time of fill or pickup? Analyze, save a life, if could be your own. For non-cave divers, it may be just a bunch of wet rocks but to the trained cave diver, the allure of history, archeology, biology, and discovery make cave diving an adventure unlike any other! Equipment maintenance and why you should care. There is a growing trend, a very dangerous growing trend in our area. I believe I know why it's occurring....though I will not point out what I believe is the cause in this blog. I will say it scares me to death. The trend I'm speaking of is the failure to properly maintain scuba cylinders. Look, as dive center staff none of us want to be portrayed as villains harping on people about visual and hydro inspections but if cylinders are not properly tested and are subsequently filled, the filler is putting themselves at huge risk of injury and potentially death. Now, thankfully reputable dive shops do not fill said tanks, thus keeping that risk to a minimum but the risk remains for those who choose to fill regardless of the consequences. Pretty please don't give shop staff the stink eye for asking not to put them in a dangerous position, they just care about safety. Both yours and theirs. VIPs should be done by a qualified individual or shop. 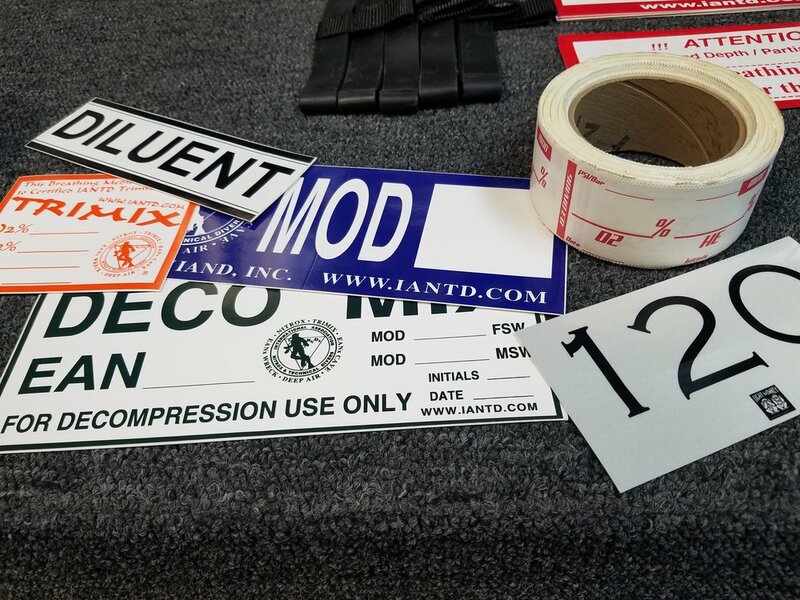 Yes there are places to buy stickers for visuals, if you aren't a qualified inspector but mark your tanks with these stickers you are potentially putting someone else at risk when they fill your tank. Ever have a burst disc blow whilst you are standing right next to a tank? I have experienced several over the years, and while this is really minute compared to what CAN happen. it's certainly a 'pee your pants' moment. Even shops have maintenance they need to undertake. I myself for example have changed a few fill whips at our store due to use over time. I had one whip suddenly blow at the fitting, the metal end hitting me square in the ribs (OUCH! ), that was a painful and almost very dangerous (as it almost hit my head) lesson I learned. This is also why our shop staff are the ones who hook up your cylinders. Tanks can and do explode. It doesn't happen often, but not oxygen cleaning the cylinder and VALVE before getting oxygen or partial pressure fills puts you at huge risk. Do you really trust that the o2 cylinder you bought off that forum is o2 clean just because the prior owner said so? Want to fill it yourself and see? I had a customer bring in a bottle once in said condition, empty, and ready to fill. I asked if I could just check the valve first before filling and LOW AND BEHOLD: silicone lubricant on the valve threads! Needless to say, a cleaning was needed but it saved me and the square block from a near-nuclear explosion as I stood nearly dumbfounded next to no less than 7 cylinders filled with pure oxygen. Oil mixed with water that came out of a cylinder needing VIP, in turn obviously requiring cleaning and tumbling. - Hydro every five years. - At hydro, burst disc and valve rebuild is suggested. It stinks to have to replace a burst disc or an internal valve seat when you JUST filled your set of double 104's....worse when they just came back fresh from hydro and no burst disc replacement was made. No one likes paying for gas twice. - Cleanings are done as required (every shop is a little different, some demand a fresh cleaning at every VIP, some at Hydro. Ask your LDS for their requirements.) If you don't know the date of the last oxygen cleaning and you need an oxygen or partial pressure fill, it's probably a safe bet you need one. Don't forget to clean the valve also, otherwise you really don't have an oxygen clean cylinder. Now go forth and have some fun and safe dives! I'm struggling for dear life trying to get my 7mm wetsuit on (nearly dying of heatstroke in the bathroom of Ginnie Springs in the process.) I finally manage to get the suit up past my hips, which is always a problem area with suits for me...but then I have to get the damned thing up my arms and all the way on my shoulders so that I at least have some form of motion in my arms. To do this, I have to hop in the water and pull, and pull, and pull, until each sleeve finally makes it to the proper place. On this day I followed this up by only an hour or so dive in my wetsuit and ended up with a slight case of cyanosis in my lips. I finally threw in the towel. It was time to try something new. I know I'm not alone in the struggle that is attempting to find a well fitting, easy to don, thick wetsuit. This is something I hear from my customers on a regular basis. The problem with wetsuits is often that they are a general size and often the sizes range over the different manufacturers. One companies womans size 8 can be the same as another companies size 10. Compounding that problem is: everyone's body is just slightly different. So the conundrum is: how do I find a suit that is both easy to get on, AND form fitting. I may have found the answer in BARE's new line of wetsuits. This year BARE is trying something a little different and using a new technology in their suits called celliant. Celliant in laymans is a new fabric comprised of several minerals which are created into a resin and spun into a fiber. The benefits of celliant are: improved circulation, cell recovery (for wound healing), and the biggest benefit for us divers; temperature regulation. Celliant has been proven effective through nine seperate clinical trials and has been used in active wear, bedding, and medical bandages. BARE's claim with their latest suits was that a 3mm feels more like a 5mm, a 5mm more like a 7mm... and so on. I was intrigued and ready to put it to the test so I ordered a 5mm Evoke suit in the red, grey, black scheme. First impressions right off the bat are the stretch on this suit is amazing! This thing has much more give than my former suit. The colors are fabulous! Very on trend with grey, robin egg blue, yellow, black, and coral red. The cut of the pattern is not the same as a thin mannequin but more like the shape of a real body. The leg zippers are quite high up the shin to make donning boots simple. It took me twenty seconds at most to get this suit on! WOW!!!! This alone is worth the price to me, no more struggle and sweating to get a suit on. I took the suit for a spin in the water while freediving for an hour and a half at Ginnie (water temp approx. 71 degrees Fahrenheit) wearing no hood. I wanted to give this suit a real go. While freediving, much of the time you are sitting completely still at the water surface doing breathups and readying yourself for the next dive. Most of the time after about an hour I'd be feeling the chill. This suit kept me quite warm. It lived up to the hype! No purple lips, no uncontrollable shivering and this is without a hood. An hour and a half and I WAS warmer in this suit than the 7mm I had worn two weeks ago. Color me impressed! After this trial, I am very pleased with my decision. The suit is great, celliant works just as promised, and no more struggle before or after the dive while dealing with a wetsuit. Next time I'll dive with a hood, and I know I'll get more time out of it. Thanks BARE, you did an EXCELLENT job! Oh and there is a male version of this suit as well so don't think they left you guys out! The Reactive is available with the same technology and materials as the female Evoke suits. Vivid beams of sunlight stream through the crackling, gin clear, cyan tinted water and into the entrance of the craggy chasm where the cave begins. The stark white limestone inside the entrance has taken thousands of years to shape and is still changing every single day. The water, at 72°F, (22°C) is quite comfortable. In fact, it’s a constant 72° year round in this part of Florida, and it’s not unusual to see several species of freshwater fish, turtles, and even river crayfish in the spring basin as you hover in the cavern entrance. If you’re lucky, during certain times of the year, you may even see one of Florida’s most popular aquatic denizens; the manatee. This is just the beginning of a world that most people will never see. Spectacular under water cave systems await those that wish to further their skills as a diver and challenge themselves to become the best that they can be. For those that choose to rise to the challenge, cave diving is an experience unrivaled in the sport of diving and a ticket to a life of adventure. For many, the idea of diving into a cave brings to mind tiny passages with barely enough room to move around, fear of running out of gas to breathe, and possibly never finding the exit. Fear not my claustrophobic friends! Most of the passages in caves like this are rather large and accommodate a team of divers quite easily! The cavern zone, where divers will stay for the first of four levels of training, is normally an ample sized space always within easy reach of the exit, and with the sun streaming in. It is a breathtaking place to be. What makes this sport so extraordinary? It’s a very specialized niche of diving; it’s certainly not for everyone but those that meet the expectations are some of the best trained divers out there. It takes the right attitude and mentality to really excel; adrenaline addiction and ego can get you killed in this world both underwater and underground. Aside from that, a serious amount of gear is required to dive safely. A diver needs two, and sometimes three or more, of just about everything. Two tanks; two dive computers to track depth, time, and other factors; three lights (yes, it’s dark down there without those). We call this redundancy, a fail-safe in-case of an equipment failure. We carry this ridiculous amount of gear, weighing altogether 100 pounds-plus (45 kilograms) in most cases, all so we can dive someplace where no human was meant to survive. Sounds crazy right? So why do people like me do this to themselves? Reasons vary by diver and we certainly don’t expect the general public to understand. Some do it to reach that next level in their dive training, some for scientific purposes, and some do it to see places that very few people ever get to see. Most of us have more than one reason why we got involved and still continue to be involved in this very unique sport. One thing is certain, though: cave diving is an extraordinary experience full of memorable adventures that will be carried with us the remainder of our lives. Hello my fellow female divers! Had a discussion with a couple of friends of mine and the topic turned into why there are so few female tech divers. None of us had the answer of course, but I thought it to be an interesting question. Would love to hear from women why and what made them decide to go "tech". For me, I need to be learning something new constantly...I have a very restless mind that needs to be occupied all the time with something. I enjoy the challenge of learning something new, performing it, and perfecting it from there. Diving has done that for me, and I've made a ton of great friends and acquaintances doing it. Looking back later on in life I know I'll have some awesome stories to share about all the wonderful experiences I've had while pursuing this sport as far as I can take it. For me diving has given me a whole different world, and at this level of diving...that world is one that so few will ever experience. I enjoy knowing that I've accomplished being able to dive at this level. I also (as many know) bring my camera along for many of these adventures so I can share these places with people who will probably only ever see these places while standing on the firm surface of the earth. So fellow lovely tech ladies, how about you? Why did you get into this level of diving? I’ve seen all too often what would normally be a very clearheaded and careful cave diver turn into a complete mess with a camera or video gear in hand. Things like buoyancy and buddy awareness are forgotten. The focus is lost on the most important parts of cave diving and instead the focus shifts to simply operating the camera. This recipe for disaster has led to fatalities. In order to prevent these tragedies and learn how to shoot beautiful images in submerged caves you must first learn how to dive to perfection in the overhead environment. Those looking to undertake underwater cave photography should realize that we still have all the usual concerns and tasks as cave divers but we have also added an entire extra set of complications and risks while shooting in caves. Shooting images in the cave environment can be wonderful and fulfilling if you are inclined to try. Images are a helpful tool to show the general public why we love doing what we do and why they should care to protect these places, plus it’s just amazing to show your friends and family why you spend so much of your hard earned money to venture underground and underwater. Nevertheless, the extra task loading of carrying photo gear on a cave dive can become a problem and it’s important to remember we are first and foremost cave divers before we are photographers. We must also be knowing and ready to take on the extra risk involved. I personally don’t like bringing a camera into a cave unless I’ve been in that cave before without the camera. I like to take my time, get to know the cave and scout out spots that might have potential to be a good place for a photo opportunity. Swimming around in the cave gets me familiar with the passages so I can keep my bearing for where I am in the cave at all times and where and how the line runs. I swim around in the areas I feel might be great locations and check for things like silt, the condition of the line in the area, and familiar landmarks that will help me remember the location for the next time I come back with a model and camera gear. This gets me prepared in advance to spend some time in this spot to get the shot I want to get. Many great opportunities for photos exist in the first 500 feet of any given cave yet are so often passed by. Carrying a camera during the entire dive may seem like a great idea at first, after all, you’ll get to catch the entire dive on camera. However carrying a large camera housing with strobes over distance can be exhausting and keeping your eyes peeled to the camera can easily get you lost, tangled in the line, or distracted if an emergency situation were to occur. Another thing to think about is flow. If you think the flow in Ginnie, Little River or similar sites is strong while swimming without a camera, you may want to reconsider before you try to haul any amount of fragile photo gear through the cave. You could easily end up damaging the equipment or even worse, endangering yourself. 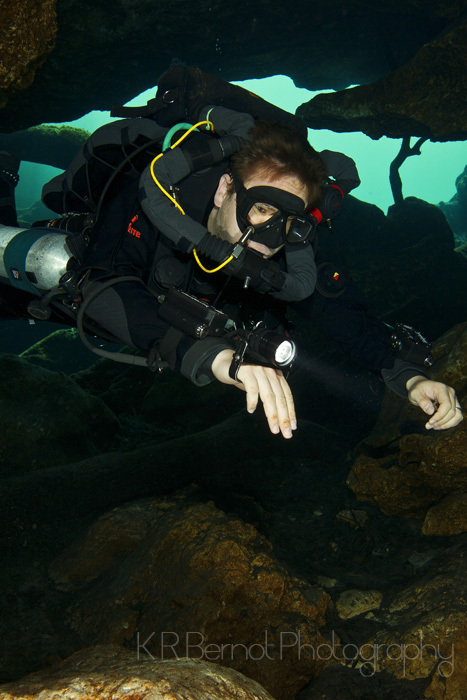 Take your time to perfect your skills as a cave diver and get to know the caves; situational awareness is an imperative skill while undertaking photography in this setting. Perfect factors like buoyancy and sac rate, and be familiar with your photo equipment before you enter the cave. Know where you are and what is going on at all times while on the dive, photo gear or not! It could be the difference between coming back with some fantastic shots and not coming back at all.